The Extraordinary Business Book Club Summer Reading List! 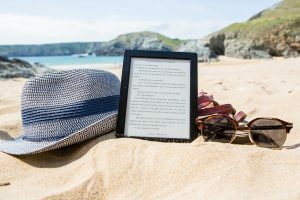 The summer is a great time to catch up with some reading, but put the chick-lit and the crime thrillers down (at least for a while) and pick up some really nourishing brainfood. I’m delighted to introduce the inaugural Extraordinary Business Book Club Summer Reading List! These are the books I’ll be taking in my suitcase this summer (well, on my Kindle in most cases) – why not join me in reading at least one of them over the next six weeks or so and share your thoughts? I’ve created a GoodReads group, which might be fun (or it might not work, we’ll see…). If you don’t GoodRead, you can always share your thoughts in The Extraordinary Business Book Club on Facebook. Be More Pirate by Sam Conniff Allende – ‘In Be More Pirate, Sam Conniff Allende unveils the innovative strategies of Golden Age pirates, drawing parallels between the tactics and teachings of legends like Henry Morgan and Blackbeard with modern rebels, like Elon Musk, Malala and Banksy. Featuring takeaway sections and a guide to build you own pirate code 2.0, Be More Pirate will show you how to leave your mark on the 21st century.’ I’m reading this one at the moment and really enjoying it! The Black Swan: The Impact of the Highly Improbable by Nassim Taleb – ‘This book is all about Black Swans: the random events that underlie our lives, from bestsellers to world disasters. Their impact is huge; they’re impossible to predict; yet after they happen we always try to rationalize them. A rallying cry to ignore the ‘experts’, The Black Swan shows us how to stop trying to predict everything – and take advantage of uncertainty.’ – Podcast guest Raj Nair recommended this one: I’ve been reading it (or rather, failing to read it) for some time now – finding it quite hard going. The Innovator’s Dilemma by Clayton M. Christensen – ‘Offering both successes and failures from leading companies as a guide, The Innovator’s Dilemma gives you a set of rules for capitalizing on the phenomenon of disruptive innovation. Sharp, cogent, and provocative—and consistently noted as one of the most valuable business ideas of all time—The Innovator’s Dilemma is the book no manager, leader, or entrepreneur should be without.’ This is one of those books I think I must have read, because I’ve heard it referred to so frequently, but actually I only know it through other people’s reports. Interested to find out whether there’s more to it than the one Big Idea about disruption that always gets talked about. Guerrilla Marketing: Cutting-edge strategies for the 21st century by Jay Conrad Levinson – ‘Filled with leading-edge strategies for marketing on the Internet, putting new technologies to work, targeting prospects, cultivating repeat and referral business, and managing in the age of telecommuting and freelance employees, among others, Guerrilla Marketing will be the entrepreneur’s marketing bible for the twenty-first century.’ I just love this title, and have often used it as an example of implicit metaphors: I thought it was about time I read the actual book! Will It Make The Boat Go Faster? Olympic-winning strategies for everyday success by Ben Hunt-Davis and Harriet Beveridge – ‘A warts-and-all authentic account of a journey to success that will show you how you can succeed in whatever you want to do.’ Another great title – this book was recommended by podcast guest Sarah Windrum and others, so I figured it was time to see what all the fuss was about. Captivate: The Science of Succeeding with People by Vanessa Van Edwards – ‘A wealth of shortcuts, systems and behaviour hacks derived from her research, to help you take charge of interactions at work and at home.’ This one just caught my eye when I was scanning the latest releases on Amazon: looks like a fascinating application of psychology/behavioural science to interpersonal relationships. If it’s rubbish, I’m sorry. The Charisma Myth: How Anyone Can Master the Art and Science of Personal Magnetism by Olivia Fox Cabane – ‘Many people believe that charisma is unchangeable – you either have it or you don’t. But that’s simply not true. This groundbreaking, bestselling book reveals how charismatic behaviour can be learned by anyone.’ On the back cover it says: ‘Soon you’ll be able to move through a room and have people say: ‘Wow, who’s that?” Well, I’m sorry, but how could I resist?? Janesville: An American Story by Amy Goldstein – ‘An intimate account of the fallout from the closing of a General Motors assembly plant in Janesville, Wisconsin, and a larger story of the hollowing of the American middle class.’ The FT/McKinsey Business Book of the Year last year, and recommended warmly by podcast guest Sarah Kessler, this sounds like a thumping good well-written story about how business matters to all of us. I’ll be sharing my thoughts on some of these in newsletters* in the coming weeks, and there’s a discussion thread for each in the GoodReads group. Look forward to hearing what you think! *Not subscribed to The Extraordinary Business Book Club newsletter? Why not give it a try: no junk, a weekly reading suggestion and writing prompt, and interesting stuff about business books. Fancy it?